Note: Originally published on this blog in late 2011, republished on the Anime Archivist blog in December 2012. In this second part of the series we’ll be looking at the magazines which made their debut from the mid 1980’s to towards the late 1990’s. This was a period where the Original Video Animation (OVA) format made its mark, and the content and focus of the magazines themselves clearly reflect this change in the anime market. 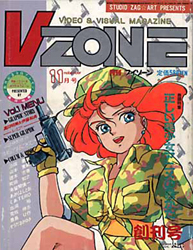 With the OVA format (that’s direct to video for you young ‘uns) really taking off, especially with the runaway success of “Megazone 23”, it was pretty unsurprising when magazines dedicated to the format began to be published. This magazine was the very first and longest surviving of the bunch. Originally beginning as bimonthly magazine from the same staff who made Animedia magazine, by September 1986 it switched to a monthly. While OVAs were the main focus of the magazine, it also looked at video releases of TV series and some films. Surprisingly adult OVAs didn’t get much of a look in (it was more of a “family” magazine like Newtype and Animage), but a small section was allocated for them, though thankfully the images weren’t explicit at all. As per other anime magazines, this one had the usual bonuses like posters, cassette labels and the like. They also included an extensive listing of all video anime video releases of the month including video covers, runtime and catalogue numbers (quite important for those who imported laserdiscs). As the OVA market began its decline in the very late 1990’s, the magazine was transformed into a general anime magazine called Looker for the October 1998 issue. Unfortunately it ceased publication in March the following year. Essentially this magazine is pretty much an advertising pamphlet for everything Bandai (or material they had a financial stake in). However you have to admit that it’s a pretty cool looking advertising pamphlet. Like a lot of these magazines, I only have a smattering of issues and nothing resembling a complete set. However from what I understand, the earliest issues resembled a mook (magazine/book) format rather than a standard magazine. Originally a bimonthly publication, like a lot of others of the period it switched to a monthly format, though I’m exactly too sure when this happened, it was probably sometime in 1986 or so. Being a magazine primarily focused on relentlessly promoting Bandai products, anime coverage wasn’t always its primary mission. Model kits featured quite often (Gunpla and the like), video games of course and surprisingly a fair wack of live action material. Not just the occasional Toei related super sentai show or “Kamen Rider” related merch, but occasionally a show like “Sukeban Deka” would make the front cover. The strange live action promotional piece for the 1988 “Appleseed” OVA also got major coverage. 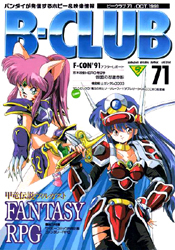 Unfortunately Bandai ceased publication of the magazine in February 1998. However the editorial staff went to Media Works to create the anime magazine Dengeki B-Magazine. Another OVA related magazine, this one is a real oddity. As I’ve said before, the video market really took off in the mid 1980’s and a number magazines dedicated to video releases appeared. The first issue of this magazine focused solely on anime with some articles dedicated to tokusatsu. It also had sections devoted to video and laserdisc (and VHD) releases, model kits and of course fandom section with letters and artwork. Pretty much standard for most anime related magazines of the time. Surprisingly from issue two, the magazine’s content changed dramatically. It became a “Fangoria” style horror magazine (the first Japanese language issue of Fangoria didn’t hit shelves until 1994). With the popularity and notoriety of the Japanese horror video market with extreme and infamous titles like “Cannibal Holocaust” (one of the most rented titles in Japan in the 1980’s) and gruesome local productions like the “Guinea Pig” series, it’s little wonder magazines like this were produced. The new format of the magazine continued on for a further nine issues before coming to a halt in April 1987. Yet another obscure magazine that I think many anime fans outside of Japan (and probably many inside Japan) had no idea even existed. 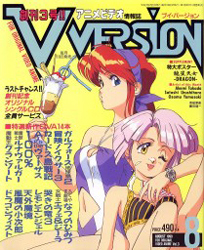 Like the previously discussed Anime V and V Zone, this magazine’s main focus was the then relatively new OVA format. Now you can tell it’s a quality magazine with a bright future because “MD Geist” was the cover of the debut issue. Just kidding. However it’s no surprise that this horrible little OVA made the cover. 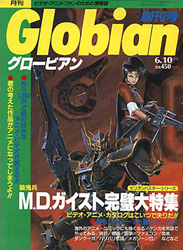 Hiro Media, publisher of Globian, had a hand in the production of that show, as well as other “classics” of the OVA format such as “The Humanoid”, “Roots Search” and “Dream Dimension Hunter Fandora”. Well OK, I admit that last one isn’t too bad, and frustratingly never made it onto the English speaking anime fandom’s radar back in late 1980’s and early 1990’s. So pretty much you could say this magazine was nothing more than an excuse to partly promote Hiro Media’s own OVA releases. 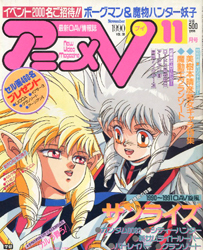 Eventually the magazine ended with a whimper after eight issues, to be nothing more than a forgotten anime magazine that even Japanese anime fans who grew up in the 1980’s don’t even recall. Surprise, surprise, yet another anime magazine dedicated to the OVA format that disappeared not too long after its release, to be forgotten and relegated to the dustbin of anime magazine history. This yet another anime/comic magazine that Out publisher, Minori Shobou, threw at the market to see if it would stick. Well, it only lasted a grand total of seven issues. If anything Minori Shobou did have a shot at just about every type of anime and comic related magazine you could think of since the late 1970’s. It’s a shame all of them pretty much fell over at one point. With Anime V being a top selling and pretty much the only OVA magazine on the market, it seems that V Version really had nothing extra to offer than what was already out there. Like the majority of anime magazines, it contained serialised manga, a serialised novel, sections on models and garage kits as well as monthly columns on voice actors and fandom sections with art and letters. 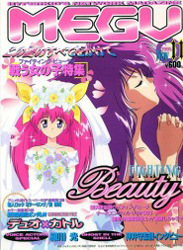 When the long reign of anime’s original magazine “Out” ended in May 1995, the staff pretty much just carried on where they left off and created Monthly Megu Magazine. What’s amazing is that there was only a month’s break between the final issue of Out and the debut issue of Megu. With a glut of anime magazines on the market and the dominance of the top three, Animage, Newtype and Animedia, well they didn’t have much of a chance really. Certainly the magazine really looks and feels like a carbon copy of others. There’s nothing to differentiate it from the rest of the pack. Megu’s masthead had the English language subtitle “Hyperkid’s Network Magazine”. I still have no idea what that actually means. After battling it out for nearly two years, the magazine ceased publication with the March 1997 issue. I was seriously considering not to include this publication as it’s not a magazine per se, but in the end I decided to. 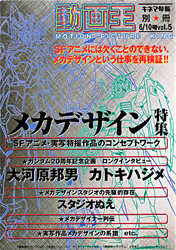 Douga Ou (or “Motion Picture King” as the English subtitle on its masthead says) was an ongoing series of mooks (magazine/books) each devoted to a certain genre of anime or a specific aspect of production. Some of the topics covered in issues were mecha and character design. The mook itself was published by Kinejun, a publishing company which for almost a hundred years has focused on cinema and published various magazines and books on the subject. 12 issues were eventually published in the series. Kinejun also occasionally publish anime series specific mooks, however these have nothing to do with the Douga Ou series. Next time I’ll have a look at the small explosion of anime magazines that appeared in the very late 1990’s during the post-Evangelion boom.